During the week of August 8, Adventures Group 4 campers will enjoy being “Olympians in training” when they participate in “mini” Olympic athletics events, and prepare a summer Olympics-inspired Friday Showcase! We will also enjoy live viewing of some of the Olympics taking place in Rio. During the week of August 8, Adventures Group 5 campers will read the books Swifter, Higher, Stronger: A Photographic History of The Summer Olympics by Sue Macy,Summer Olympics by Clive Gifford, Olympia – Warrior Athletes of Ancient Greece by David Kennett, and The Olympics by Matt Christopher. Throughout the week, we will compete in our own mini Olympics including jumping, stretching, and rolling different objects. We will also look forward to using the art of pointillism to create unique Olympic watercolors! This week Adventures campers in Spanish will learn how to say and read the numbers 0-20 in Spanish, skip count to 50 “cincuenta” and learn the numbers 100 “cien” and 1,000 “mil”. In Drama we’ll play charades with the vocabulary theme words for Animals in the farm “Los Animales de la Granja” and common places and careers in the community “La comunidad”. In Cooking, we will make mini pizzas and continue learning words associated with baking, cooking and being courteous in Spanish (mezcla, echar, maza, chocolate, vainilla, queso, limonada, agua, por favor y gracias – mix, pour, dough, chocolate, vanilla, cheese, lemonade, water, please and thank you). We will also create Tasty Torches made from rice crispies and sugar cones! During the week of August 8, Adventures campers will review all the fun songs and games that we have learned so far this summer, and we will prepare for our last Friday Showcase event! During the week of August 8, our Adventures campers can look forward to a (final) week of fun! Water Play Day is Tuesday, August 9: Campers should bring bathing suit, towel, water shoes, sunblock, and a change of clothes. Theme Thursday is Thursday, August 11: Pajama Day! Wear your comfy PJs to camp! Face Painting is (also) taking place on Thursday, August 11. 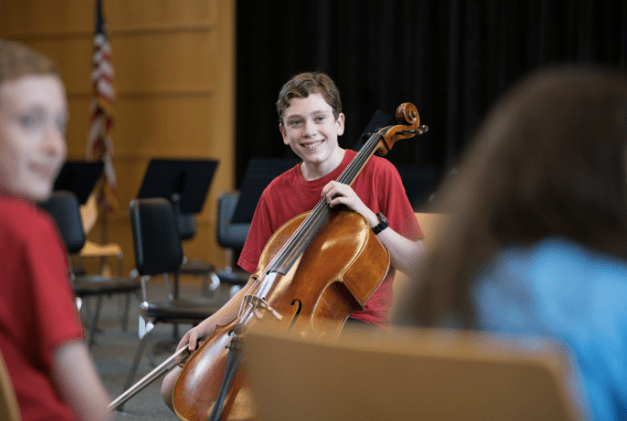 Farewell Showcase is Friday, August 12 from 2:15 to 3:15 PM, in the Lower School Gym, Drapkin Hall. It’s hard to believe that next week will be our last week in camp! This summer, we’ve reacquainted with old friends and even made some new ones. Additionally, students gained a tremendous amount of knowledge about the Olympics. Wednesday, August 10 – Olympic Field Day! Thursday, August 11 – Theme Thursday – Pajama Day! Campers are welcome and encouraged to come to camp in their comfy PJs!! During the week of August 8, Discoveries Yellow Group campers will be talking about the events in the upcoming summer Olympics, including comparing the number of events that take place at this time as compared to the winter Olympics. In addition, our campers will do some of their own Olympics-inspired physical activities, going outside to run, jump and throw! During the week of August 8, Discoveries campers will discuss and learn more about the styles of modern painting, including examples by famed artist Piet Mondrian, and they will also continue to practice observational drawing. During the week of August 8, Discoveries campers will sing the chants: “La araña pequeñita” and “El Osito” (The Itsy Bitsy Spider and Little Bear). They will also decorate their “ositos” faces (little bear faces) to use during retelling the story “Ricitos de Oro y los tres ositos” (Goldilocks and the Three Bears). In addition, campers will learn the color “anaranjado” (orange) and review the other colors by playing “Pescando” (Going Fishing). They will also say and sing the numbers 1-20 in Spanish and the month “Agosto” (August)!